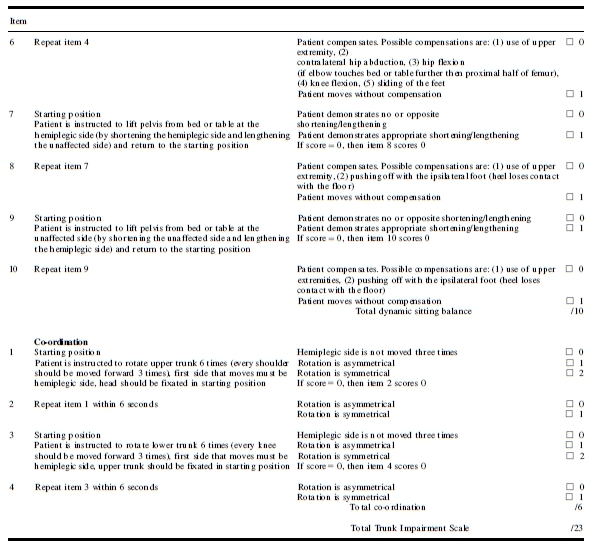 This scale aims to evaluate the trunk in patients who have suffered a stroke(Verheyden et al., 2004). The TIS was developed by Verheyden et al., and aims to evaluate the trunk in patients who have suffered a stroke(Verheyden et al., 2004). As described by Verheyden (Verheyden, Nuyens, et al., 2006), the TIS assesses static and dynamic sitting balance and trunk coordination in a sitting position. The static subscale investigates: (1) the ability of the subject to maintain a sitting position with feet supported; (2) the ability to maintain a sitting position while the legs are passively crossed, and (3) the ability to maintain a sitting position when the subject crosses the legs actively. The dynamic subscale contains items on lateral flexion of the trunk and unilateral lifting of the hip. To assess the coordination of the trunk, the subject is asked to rotate the upper or lower part of his or her trunk 6 times, initiating the movements either from the shoulder girdle or from the pelvic girdle, respectively. For each item, a 2-, 3- or 4-point ordinal scale is used. On the static and dynamic sitting balance and coordination subscales the maximal scores that can be attained are 7, 10 and 6 points. The total score for TIS ranges between 0 for a minimal performance to 23 for a perfect performance. In a recent version of the TIS (version 2.0) for adults, the static subscale was removed because of a ceiling effect, total score ranges between 0 and 16 points (Verheyden & Kersten, 2010). Clinical message . The Trunk Impairment Scale (TIS) is a new tool to measure motor impairment of the trunk after stroke. . The TIS evaluates static and dynamic sitting balance as well as co-ordination of trunk movement. . The TIS has sufficient reliability, internal consistency and validity for use in clinical practice and stroke research. Intra-observer and inter-observer reliability is high. Test/retest and interobserver reliability for the TIS total score (ICC) - 0.96 and 0.99, respectively. The 95% limits of agreement for the test/retest and interexaminer measurement error - 2/2.90, 3.68 and 2/1.84, 1.84, respectively. Cronbach alpha coefficients for internal consistency range from 0.65 to 0.89. The Effectiveness of Driving Game on Trunk Control and Gait Ability in Stroke. ↑ Verheyden, G., Mertin, J., Preger, R., Kiekens, C., & Weerdt, W. D. (2004). The Trunk Impairment Scale: A new tool to measure motor impairment of the trunk afterfckLRstroke. 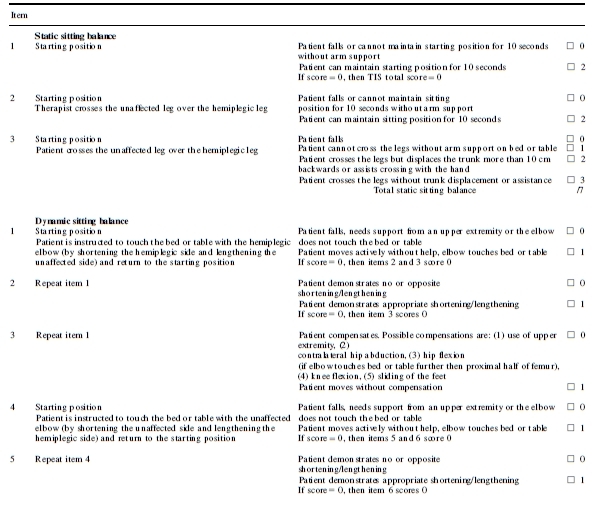 Clinical Rehabilitation, 18, 326–334. ↑ Verheyden, G., Nuyens, G., Nieuwboer, A., Asch, P. V., Ketelaer, P., & Weerdt, W. D. (2006). Reliability and validity of trunk assessment for people with multiplefckLRsclerosis. Physical Therapy, 86(1), 66–76. ↑ Verheyden, G., & Kersten, P. (2010). Investigating the internal validity of the Trunk Impairment Scale (TIS) using Rasch analysis: The TIS 2.0. Disability andfckLRRehabilitation, 1–11.